Reference number for this case: 10-Oct-54-LaLoupe. Thank you for including this reference number in any correspondence with me regarding this case. Sunday morning, four members of a family of La Loupe, who awaited a train on the station platform, saw distinctly in the sky, a white disc which, seeming to rotate on itself, disappeared quickly in the clouds. In addition, in Vaupillon, a mysterious apparatus which changed colors would have been noticed as it also moved under the vault of heaven. Lastly, in Saint-Eliph, two people noted numerous phenomena like we told it besides in our chronicle "a disc..."
The multiplication of the saucers and the cigars under the sky of France, and also of Eure-et-Loir, always attracts "crescendo" the curiosity of the public. Of course, the area of La Loupe could not remain "out of the race" for a long time. It is all the same, to some extent, a question of prestige. Let us be thus satisfied: we have it finally, our saucer... almost! Last week, indeed, in a meadow located at the edge of Saint-Eliph, a female resident of this locality saw, around 9 hours of the evening, a white form - not that "which goes without noise and tightens the arms" of the poet. The onlooker, who certainly is in good faith, saw only rather vaguely the object which seemed immobilized in space at her height and under which she distinguished two kinds of black appendices. The woman seized by fright returned very quickly to her home. Beforehand, she had seen multicolored gleams in the sky. Moreover another inhabitant of Saint-Eliph also noticed, one evening, a certain phenomenon: a bluish gleam which passed like a fireball in front of his window. 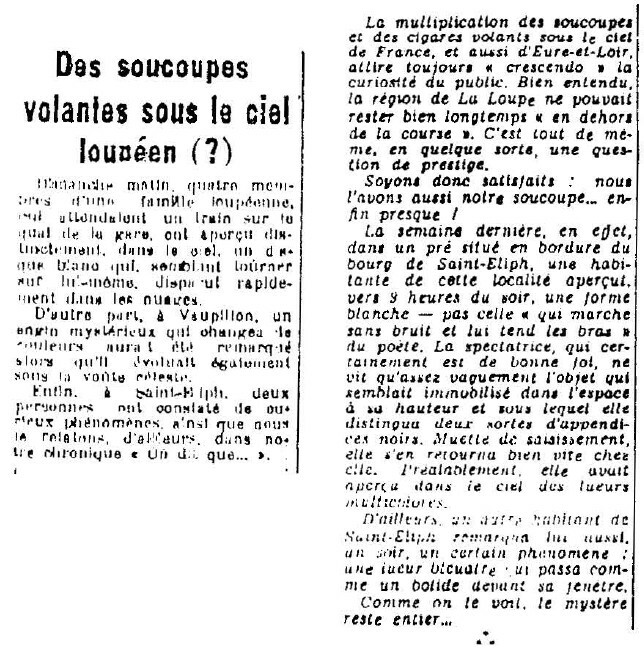 [er1] Article in the regional newspaper L'Echo Républicain, France, October 12, 1954.